Total Area: 1268 Sq. Ft. 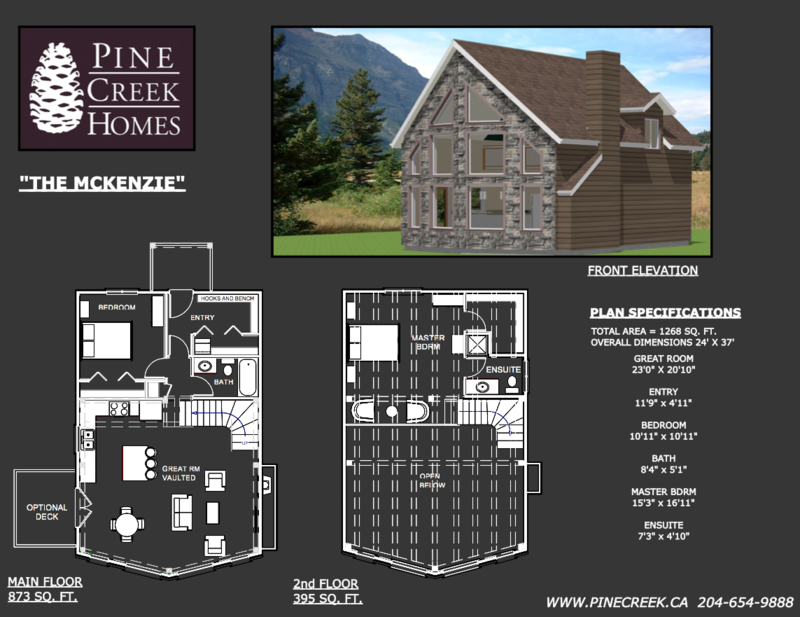 This 1,268 square foot, two bedroom, two bath plan, was originally designed for a lakefront cottage. 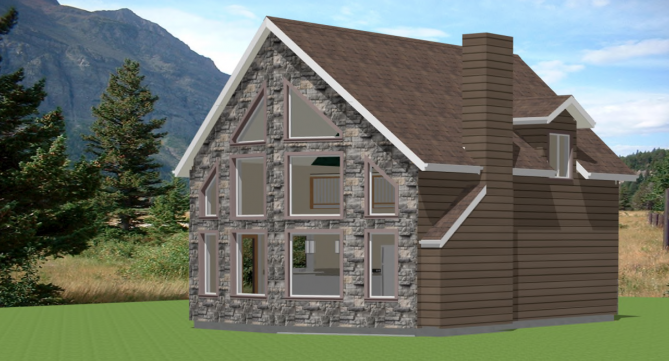 The wall of windows would face the lake and the covered back entry would be the side where you would drive up to. With 20 foot vaulted timber frame ceilings, the great room is wide open and spacious and is flooded with natural light during the day. There is a built-in fireplace with plenty of room beside it to create a custom built-in entertainment unit (and maybe even some wood storage). The stairs in this design are tucked neatly into the corner to maximize space in the living area. The kitchen is set-up to maximize usable space – with an eat-in island that can be used for food prep, eating or entertaining, you’ve got all the bases covered. Sitting in the dining room is one of the most enjoyable spots to be in this home. With patio doors beside you and a wall full of windows on the other side, you really take in the outdoors when sitting in this space. This design is a hybrid timber frame, meaning the great room and living are timber frame and the bedrooms are conventional construction. On this plan, however, the timbers carry right through into a loft style master bedroom. The master suite is very spacious with room for some furniture to sit and enjoy the view from the second floor. With an ensuite bathroom and a large walk in closet, this space has everything you need. This open timber frame ceiling gives a fantastic feel to the master bedroom, and because it’s an open loft style bedroom, you get to wake up and look straight out the front wall full of windows onto the lake. That’s what waking up in cottage country is all about.